E-commerce is the future, and capitalizing on customers is the number one goal. A new year is an opportunity to gain insight and create new strategies to appeal to customers in 2018. Pay close attention to these seven e-commerce trends for the year. Businesses are e-mailing customers more often to stay relevant. E-mail is more effective at creating revenue than all social networks combined, and drives users to visit the site, even if they don’t purchase anything on that trip. Companies such as Rebel are making it possible for customers to buy goods right from their inbox, opening a completely new horizon. 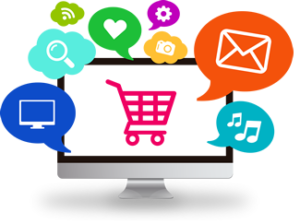 E-commerce relies on interacting with other departments such as social media, search engine optimization, and content marketing to develop an effective strategy. These platforms need to communicate to align efforts for creating a successful plan, including having an effective Ecommerce web design on your site. E-commerce needs to focus on engaging users and advertising more to drive traffic. Brands that engage with their audiences will gain ground over their competitors. It’s harder to bring customers back once they’ve left than it is to continue to keep them involved with your brand. 85 percent of customers do research before making an online purchase, increasing the need to organic search results. Continue to build content and work with a PR strategy to not only sell products, but educate and inform your visitors as they’re making their purchase decisions. Customers crave the individual experience. Personalization fosters a unique connection and appeals to a wide base of people. Personalization makes someone feel special, and there’s no reason not to use it with the new wave of e-commerce trends. E-commerce was a relatively straightforward field, but times are changing and so are the skills needed to be successful in the technological world. Departments continue to interact more and more with each other to aid in developing skills that translate across the entire company. Smart assistants, such as Siri or Alexa, were initially put on the market with the goal of assisting individuals in their daily tasks. Voice capabilities make it possible to order something using your voice for a completely hands-free experience when shopping. The trend isn’t going anywhere, and it’s something to look into if you want to remain competitive. Other trends such as video, interactive content, and mobile optimization are more trends for 2018. Anything that helps users have a positive experience is a step in the right direction.